The Werribee City Centre is ‘The Heart of Wyndham’ and ‘The Capital of Melbourne’s New West. It is home to 430 businesses, employs over 1,600 people across 15 industry sectors, produces a total estimated output of $400 million per annum, and is Wyndham’s designated principal activity centre. The community vision is for the Werribee City Centre to continue to grow as a vibrant, active place for people, embracing its river and central park setting. A vibrant strong and growing Werribee City Centre is needed to anchor Wyndham’s rapid population growth, by providing additional local jobs, independent business opportunities, local services, city living opportunities, and places for events, community recreation and culture. The Werribee City Centre Structure Plan details the vision and strategic plan for the City Centre. The Structure Plan was adopted by Council in 2013, following extensive community consultation engaging hundreds of community members, an extended public exhibition process, and a full Wyndham Planning Scheme Amendment process. Schedule 1 to the Activity Centre Zone specifies the planning requirements and guidelines for new development in the Werribee City Centre. Schedule 1 to the Parking Overlay specifies the parking provisions for new development in the Werribee City Centre. These policies were incorporated in the Wyndham Planning Scheme in 2015 as part of Wyndham Planning Scheme Amendments C150 and C151. An Action Plan is currently being prepared to address community objectives and deliver upon the community vision for the Werribee City Centre. If you have questions or would like further information please contact Wyndham City’s Vibrant City Centres Department on 9742 0905 or werribeecitycentre@wyndham.vic.gov.au. In recent years Wyndham City Council, the State Government and the Federal Government have invested in the construction of major projects in the Werribee City Centre, including: the Wedge Street Piazza, Wyndham Park Pedestrian Bridge, and Werribee River Trail Underpass. These projects have implemented key parts of the Werribee City Centre Structure Plan, and paved the way for increased private investment, visitation and activation. Four upcoming new developments will act as major catalysts for the continued growth of the Werribee City Centre. For further information visit Werribee Catalyst Sites. The West End Catalyst Site was purchased by Wyndham City in 2016. The site was purchased for medium-term and longer-term purposes. In 2017 a large ground level car park will be constructed on the site. This parking will replace existing public parking on the other Catalyst Sites when they are being developed, and meet short-to-medium-term parking needs. The Bridge Hotel Building is located in the north east corner of the West End Site. It is planned to revitalise the Bridge Hotel Building as a quality food and beverage destination. An Expression of Interest process is currently underway to select an operator. Wyndham Park is the Werribee City Centre’s central park. The Wyndham Park Development will establish it as a recreational and events space of regional significance, and the centrepiece of the Werribee City Centre. Concept design is underway. Funding to commence construction is allocated in the 2017/18 Wyndham City Budget. $3.2 million in State Government Funding has also been awarded to the project through the Growing Suburbs Fund. Further community consultation on the concept design is planned prior to design finalisation and construction. The Riverbank Promenade Development is central to the objective of the Werribee City Centre embracing the Werribee River and Wyndham Park. It has the potential to transform Werribee into a riverfront city. 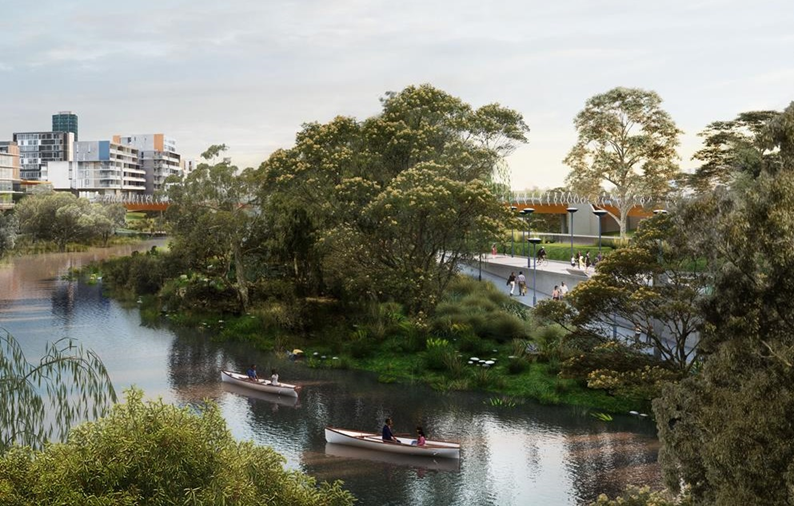 The Riverbank Promenade Development is planned to extend from the Riverbend Site at its eastern end, meet the Wedge Street Piazza and Wyndham Park Pedestrian Bridge at its mid-point, and then continue west to the Chirnside Park Hub Development. 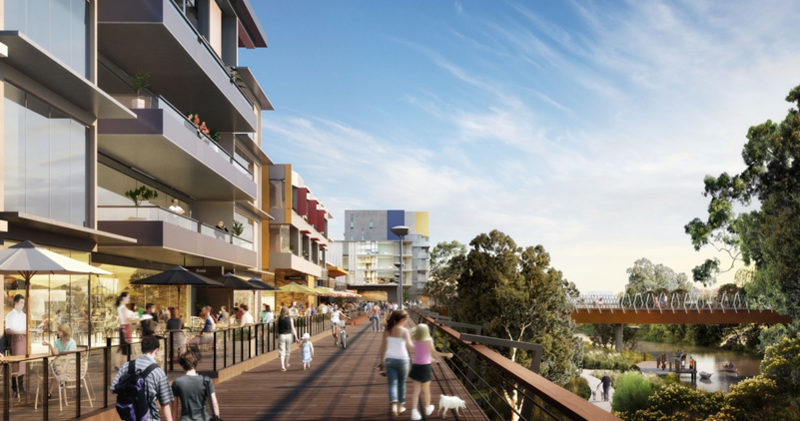 The Promenade is to be elevated amongst the tree-tops, connected to businesses on one side, and with views over the beautiful Werribee River and Wyndham Park below. This project will provide the community with increased opportunity to enjoy these unique assets, while also stimulating increased development, visitation, city living and employment. The public spaces, streetscapes and services in the Werribee City Centre are proposed to be upgraded to enhance amenity, support on-street activity and encourage new development, jobs, services, attractions and city living. The aim is to create a vibrant place for people. A masterplan is currently being drafted. Community consultation will soon be undertaken to inform this work. A draft Werribee City Centre Parking Strategy is currently being prepared. It will soon be exhibited for community consultation. The draft Parking Strategy has been prepared to manage parking in the City Centre and support the growth of Werribee as a vibrant, people-friendly City Centre that is accessible to all. The $11.75m Chirnside Park Hub Redevelopment will provide a major new attraction and community facility at the western end of the Werribee City Centre. The Victorian Department of Justice has contributed $250,000 as part of its Public Safety Infrastructure Funding towards the Kelly Park Enhancement Project. Kelly Park is an important community asset, being shared by a wide range of groups and located close to the heart of the Werribee City Centre. The park is used by both young and old and it has the potential to be a vibrant place for people to come together. In August 2016 Council undertook initial consultation with groups that use Kelly Park and the message we received was that some people have safety concerns that are keeping them away from the park. This enhancement project will aim to address those concerns, by improving the look and feel of the area. With the nearby Cherry St catalyst site set to be transformed by the development of a landmark building, the enhancement of Kelly Park will encourage more people to use the park and connect with other members of the community. For more information visit Kelly Park Enhancement.